Do You Do The Electrical Work When Installing A New Heating System? Do You Do Ventilation, Sheet Metal And Duct Work? How Much Money Can I Save With A Heat Pump? How Much More Efficient Are Heat Pumps? It feels better every day of the year with a higher standard of comfort. Cool, crisp air in the summer. Gentle, welcoming heat in the winter. Reliability and efficiency every day of the year. American Standard Heating and Air Conditioning heat pumps are your solution to a more comfortable home, and more efficient energy consumption. Choose from our ultimate Platinum Series, our hardworking and efficient Gold Series, or the reliable comfort of our Silver Series. Each one delivers more than you’re expecting, because you’ve moved up to a higher standard of comfort. 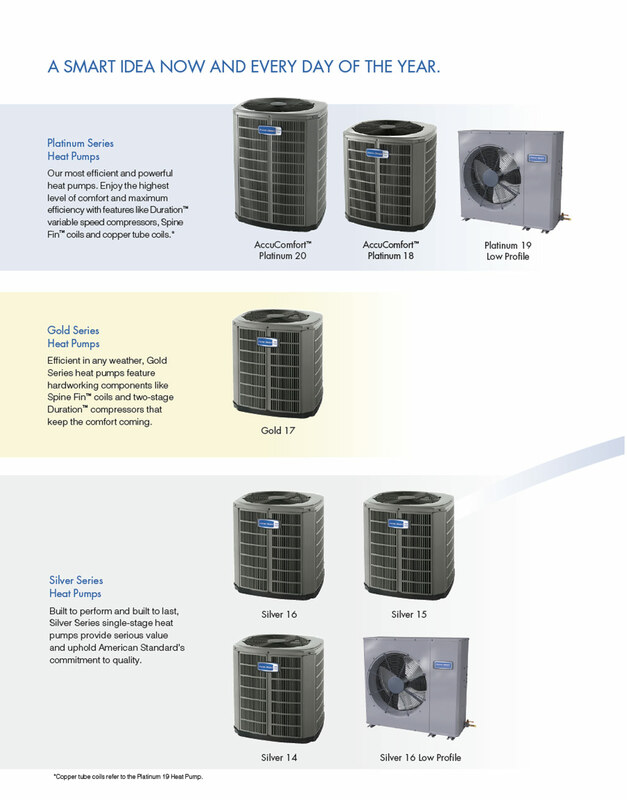 Platinum Series Heat Pumps – Our most efficient and powerful heat pumps. Enjoy the highest level of comfort and maximum efficiency with features like Duration™ variable speed compressors, Spine Fin™ coils and copper tube coils. Gold Series Heat Pumps – Efficient in any weather, Gold Series heat pumps feature hardworking components like Spine Fin™ coils and two-stage Duration™ compressors that keep the comfort coming. Silver Series Heat Pumps – Built to perform and built to last, Silver Series single-stage heat pumps provide serious value and uphold American Standard’s commitment to quality. Sub Zero is a family owned and operated mechanical contracting business. SUB ZERO HEATING & COOLING Ltd. Serving the HVAC needs of Vancouver Island and the Gulf Island communities with honesty and integrity.